In principal, the transition toward a low carbon and renewable energy system is a positive change toward a sustainable future. In practice, the large-scale implementation of renewable energy (RE) production systems brings new demands to local land-based economic activities and ecosystem services as well as unfamiliar opportunities and challenges to households, communities, planners, and policy-makers. In other words, the transition to RE resources is necessarily disruptive to prevailing socio-ecological systems and is in some cases (perceived to be) socially and environmentally regressive. Anyone can sign up for Geog-Coffee-Hour-L@lists.psu.edu for a Friday morning announcement about the upcoming lectures. UROC allows undergraduate students to gain valuable research experience and technical skills through collaboration on projects within the department and supervised by faculty and/or graduate students, as well as 1-3 credit hours to apply towards graduation. This is a valuable resume-building experience for undergraduate students and can be beneficial for both future employment and graduate school. The Bad Latitudes will once again be fielding a co-rec soccer team this fall. All students, faculty and staff are encouraged to join, and any skill level is welcome. Large chlorophyll anomalies are observed after the 2011 Japanese tsunami using the NASA MODIS instrument onboard the TERRA and AQUA satellites. These anomalies are observed both along the eastern coast of Japan, where the tsunami wave hit with maximum force, and in the deep water surrounding the epicentral region. Although both satellites show agreeing spatio-temporal patterns, larger anomalies are detected using the AQUA satellite. A temporal analysis shows increased chlorophyll concentrations immediately after the tsunami, and higher values are observed for nearly one month before reversing to pre-tsunami levels. Increasing environmental variability associated with global climate change is expected to produce social instability and human displacement in future decades. As such, there remains a pressing need to understand the implications of environmental changes for human populations and their adaptive capacities. This paper analyzes governmental and intra-community responses to environmental variability through a case study from the Okavango Delta, Botswana. We report findings from fieldwork conducted during May–June 2011 and October 2012–May 2013 in the village of Etsha 13. Following an increase in annual flooding in 2009, 2010, and 2011, the Government of Botswana permanently relocated hundreds of residents to a nearby dryland area, asserting that this new settlement was necessary to reduce future risks from flooding variability. While some residents accepted this position, others elected to return to the floodplain or to illegally divert the flow of the water to protect their homes. This paper explores the micro-politics of these relocation efforts and competing responses in order to examine differential adaptive responses to increased flooding levels. We situate these findings within the burgeoning literature on transformative adaptation and suggest that micro-political dynamics are critical in shaping the limitations to, and possibilities for, effective adaptive responses to global environmental change. Humans are playing a larger and larger role in the increasingly rapid disappearance of glaciers around the world and nowhere is the evidence clearer than in Western Canada, says newly-published research. “It’s another nail in the coffin of the idea that we’re not blame,” said Graham Cogley, a Trent University geographer, who has co-authored research that appeared this month in the journal Science. Why do so many Americans deny climate change? 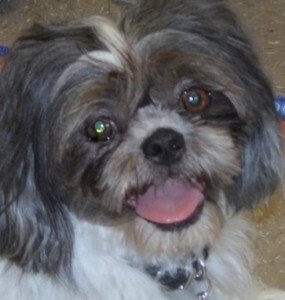 Last week’s mystery dog was Ben, belonging to Deryck Holdsworth and Susan Friedman. Barbara Luther was the first to respond with the correct answer. 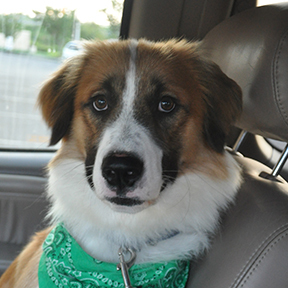 Send your answer to geography@psu.edu along with a photo of your dog for our mystery dog of the week! 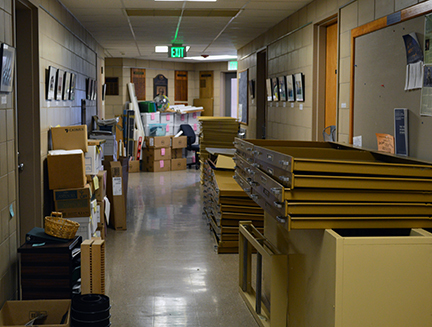 Faculty and staff moved offices this summer, and several offices were updated. Old built-in map drawers and cabinets were removed, walls were painted, and lots of old paper journals were recycled. Some of the map drawers from third floor offices found a new home in the Vegetation Dynamics lab. Guido Cervone has been named the associate director of the Institute for CyberScience at Penn State. The new graduate students have arrived. They are: Kevin Berstein, Yanni Cao, Elizabeth Dzwonczyk, John Dzwonczyk, Carolyn Fish, Laura Hardine, Karen Paiva Henrique, Carolynne Hultquist, Mario Machado, Elena Sava, Narmadha Senanayake, Mark Simpson. The Human Factors in GIScience Lab had a very productive summer: Over half a dozen peer-reviewed scientific contributions were accepted at international journals (Spatial Cognition and Computation, Environment and Behavior, Cartography and Geographic Information Science) and leading conferences (Spatial Cognition, GIScience). Topics addressed in these papers span central research themes in the spatial and cognitive sciences such as crowdsourcing, space syntax, how humans understand geographic space, the commonsense ontology of geographic concepts, land cover classifications, the validation of cluster algorithms, route directions, uncertainty, map design and more. Dangling over the side of a 4-foot hole on a forest floor, Penn State undergraduate Kim Schmid spent the better part of a recent day digging in the dirt — or collecting soil samples, to be technical. The end goal: a better understanding of the seasonal ponds known as vernal pools, how they form on shale landscapes and the best way to manage them. That meant Schmid and fellow student John Schneider took turns with a shovel and a post hole-digger — mosquitos and gnats notwithstanding. Then, starting from the top and inching down they collected samples from each layer of soil. The next step was a ground-penetrating radar survey to unravel the subsurface layers and measure the depth to solid rock beneath them. The work is part of a larger project White is collaborating on with colleagues from Riparia at Penn State: Rob Brooks, professor of geography and ecology; Sarah Chamberlain, botanist; and undergraduate intern Dylan Kubina. Riparia’s contribution is to characterize the plant communities of three clusters of vernal pools in similar geologic settings. In the past 20 years, feminist geographers have gone to great lengths to complicate notions of ‘the field’ and make clear that the field is not an easily bounded space. This body of work has demonstrated the complexity of field spaces, explored ways to destabilize boundaries, and traced the power relations between researchers and participants. Ultimately, this work takes the breaking down of boundaries as an inherent good in field research, and, subsequently, little work has focused explicitly on the utility of physical and emotional boundaries that develop in field research. Our experiences as feminist geographers who reside in our fields show there is much left to understand and subsequently disrupt regarding the boundaries of ‘the field.’ In this article, we build on the concept of ‘intimate insiders’ to discuss the complex negotiation of doing research in the places where we have created personal lives and our sense of community. We often found ourselves struggling to define the physical and emotional boundaries of ‘the field’ on the outside for the sake of our participants and ourselves. In this article, we reflect on boundary-making as a specific feminist methodological practice for addressing the complexity of fieldwork. Who is this mystery dog? Who is his human? 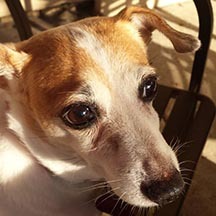 Fire field work | Mapping Ebola | Dutton publications | Dog of the week and more! Alan Taylor (right) and Lucas Harris investigate past and present fire in Yosemite National Park. 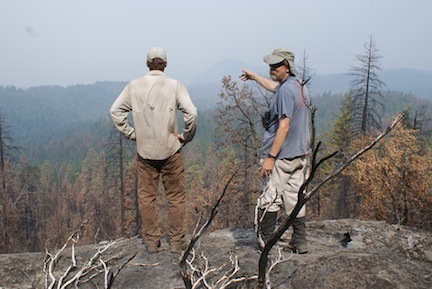 Lucas Harris and Alan Taylor conduct field work in Yosemite National Park inside the perimeter of the 2013 Rim Fire, the third largest in California history. The Rim Fire burned over an area Taylor studied 10 years ago providing a unique opportunity to quantify the effects of the fire. Another fire started in Yosemite while they were there this year. It has burned 4700 acres so far and is responsible for the smoke you can see in the picture. Corene Matyas (Ph.D. ‘05) has been named Colonel Allan R. and Margaret G. Crow Term Professor by the College of Liberal Arts and Sciences at the University Florida for 2014–2015. CLAS Term Professorships are awarded to outstanding faculty who excel in both scholarship and teaching. 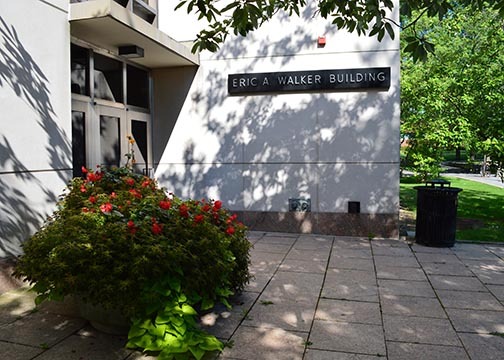 These professorships, funded entirely by private sources, allow the college to recognize faculty who are making a significant difference in the classroom as well as through their scholarship. Wei Luo passed his Ph.D. dissertation defense on July 23, 2014. He starts his post-doc position in the School of Computing, Informatics & Decision Systems Engineering at Arizona State University this coming fall. He will work on the NGA project to address national security risks of climate change: https://asunews.asu.edu/20140618-asu-nga-address-climate-change. Last summer I had great pleasure working in the field with two good friends, though not at the same time. This summer I am working with two research assistants throughout the summer. I am hopeful that having three people in the field with both speed up the sampling as well as provide a safer work environment on these remote mountain peaks. Cocoa farmers this year will lose an estimated 30 to 40 percent of their crop to pests and disease, and with chocolate prices having risen globally by roughly two-thirds in the past decade, concern is growing about sustainability in cocoa production. Of particular concern are the environmental impact and human health risks of toxic agrichemicals – organochloride insecticides and heavy-metal-based fungicides – used in cocoa production to fight pests and disease. To fight the worst Ebola outbreak in history, the American Red Cross is attempting to get ahead of the virus by creating the most detailed maps of rural towns and villages so officials can track the deadly virus as it spreads. The aid group is enlisting volunteers—maybe even you—to help map the areas hard hit by the virus through its Geographic Information System program. Anyone who wants to volunteer can join online. By Luo, H., Robinson, A. C., & Park, J. Y. Peer grading offers a scalable and sustainable way of providing assessment and feedback to a massive student population. However, currently there is little empirical evidence to support the credentials of peer grading as a learning assessment method in the MOOC context. To address this research need, this study examined 1,825 peer grading assignments collected from a Coursera MOOC with the purpose of investigating the reliability and validity of peer grading, as well as its perceived effects on students’ MOOC learning experience. The empirical findings provide evidence that the aggregate of student graders can provide peer grading scores fairly consistent and highly similar to instructor grading scores. Student survey responses also indicate peer grading activities to be well received by a majority of MOOC students, who believe it was fair, useful, beneficial, and would recommend it to be included in future MOOC offerings. Based on the empirical results, this study concludes with a set of principles for designing and implementing peer grading activities in the MOOC context. Effect of Geographic Distance on Distance Education: An Empirical Study. This study investigates the effect of geographic distance on students’ distance learning experience with the aim to provide tentative answers to a fundamental question – does geographic distance matter in distance education? Using educational outcome data collected from an online master’s program in Geographic Information Systems, this study calculates the distance between students’ residences and the program location, and employs three hierarchical multiple regression models to examine how well geographic distance can predict a student’s online learning performance, satisfaction with the program, and length of time to complete, when controlling for other relevant factors. Our research findings provide empirical evidence to support the claim that the development of information and communication technologies (ICTs) has in fact overcome the potential barriers that may be associated with distance in education and has provided an effective bridge between students and educational programs. The study also reveals interesting discoveries regarding the relationship between students’ distance learning experience and certain student characteristics such as age, gender, and previous academic achievement. 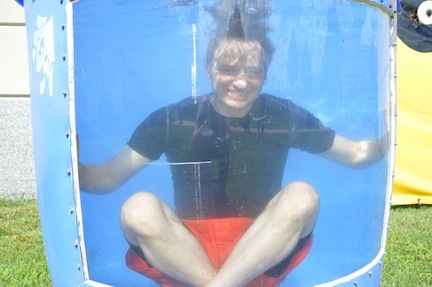 Alex Klippel took the plunge during the EMS Carnival, hosted by the Staff Advisory Committee (SAC) on July 16, 2014. Donations from the event went to the EMS Staff Centennial Award. Nathan Amador passed his Ph.D. dissertation defense in July 2014. He starts his tenure-track position in Physical Geography at Ohio Wesleyan College (Columbus) this month. Mark Milliron ’83 GEOG, ’91 MPA Lib, ’96 MS H&HD, ’13 MHS Hershey (NROTC), is Senior Emergency Response Planner with enGenius Consulting Group of Huntsville. Al. for a disaster planning project at the Federal Emergency Management Agency (FEMA) Region III office in Philadelphia. He lives in Lemont, Pa. Father: L. James ’60 MEd Edu; Sister: Sharon Bloom ’84 Bus; Brother: Michael ’92a Agr. Using large public datasets in the undergraduate ecology classroom. In Frontiers in Ecology and the Environment 12: 362–363.